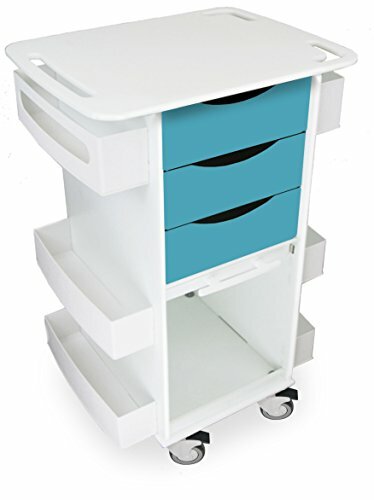 TrippNT's bahamas sea teal polyethylene Core DX multi tasking locking storage cart with clear door offers an efficient way to sort, store, organize, lock and transport a wide variety of supplies with drawers, shelves, built in glove and tissue dispensers and bulk storage features. Constructed from tough, non-reactive white high density polyethylene, ABS and PETG this lab cart glides smoothly across most surfaces on its 4 heavy duty 3-inch non-marking rubber casters with brakes. The small footprint allows it to be stored securely and unobtrusively out of the way. It features 3 full extension drawers and 6 side compartments, 2 with dispensing slots. A large bulk storage area with a locking sliding, clear PETG door secures supplies. Document holder. Pen and tool holder. Built in, easy-to-grab handles. Professional, clean appearance. Fully assembled (except casters). Drawer measures 12-3/4-inches width by 3-5/8-inches height by 15-7/8-inches depth. Measures 23-inches width by 35-inches height by 19-inches depth; 61 pounds. TrippNT manufactures storage products, dispensers, carts, workstations, and shields for scientific laboratory applications. The company, founded in 1993, is headquartered in Kansas City, MO.